JBL Reflect Mini BT review | What Hi-Fi? With smartphones shedding headphone jacks as if they’re less fashionable than a fox fur scarf, wireless headphones have never been more popular than they are right now. At £80, JBL Reflect Mini BTs let you stay on trend without spending a fortune. The Reflect Mini BTs are the most practical kind of wireless in-ear headphone going. They use Bluetooth to stream music from your tablet or smartphone, and have a wire connecting the earpieces. They might be wireless earphones with a wire, but it’s a pretty handy wire, letting you wear the JBL Reflect Mini BT around your neck should you need to talk to someone at the gym, for example. Aside from Bluetooth, other parts that make the JBL Reflect Mini BT ‘sporty’ are a reflective neckband, handy for roadrunners, and IPX4 water resistance. This involves a rubbery seal over the microUSB charge socket, letting you sweat without risking harm to the battery or electronics. Typical of a sports earphone, the JBL Reflect Mini BT also use in-ear hooks rather than just normal tips. These offer greater stability. However, they so take some fiddling to achieve a good fit. When first using the earphones, we didn’t manage to fit them properly and they sounded a lot thinner as a result. As well as two sizes of earhooks, the JBL Reflect Mini BTs come with a couple of pairs of normal tips. They offer a less secure, but also less fiddly, fit. There are no issues pairing and the range is excellent, but we have a slightly mixed experience with the JBL Reflect Mini BT’s wireless. They are susceptible to blips caused by movement, or knocking of an earpiece. It’s not an easily reproducible phenomena, though. We’ve used them in the gym with few issues, but every now and then there’s a digital blooper. The Mini BTs last up to eight hours off a charge, roughly the standard for this kind of earphone and better than the stamina of most of the true cable-free options available. You charge the battery using a microUSB socket on the rubber-coated three-button remote. The characteristic we’ve come to expect from sports earphones is pounding bass. It gets you running faster, and makes for sound that can compete with noisy environments better. You don’t get that here, though. The JBL Reflect Mini BT’s bass is relatively reserved, and its depth is not too hot, trailing off towards the very lowest frequencies. Bass beats don’t have the impact some of you may be after. They avoid any sense of bass murkiness, though, and as long as the tips are inserted properly, the JBL Reflect Mini BTs don’t sound thin. Instead, the focus is put on the mids, which have good presence if not any better detail than we’d expect from an entry-level wireless pair. The JBL Reflect Mini BT sound clean and balanced enough, but are not masters of insight. Similarly, they are not harsh or overly bright, but lack any particular smoothness or notable refinement that would give them a truly ear-charming quality. Their lack of dynamics and separation limit involvement too, although their treble is slightly more pronounced than that of the SoundMagic E10 BT. The result is a sound that’s fine, even unusual in its class, but is unlikely to bowl you over. It’s clear, and offers better tonal consideration than bundled earphones, but they’re most notable for inhabiting a comfortable middle-ground: cheaper than the well-populated £150-odd set, better than some budget pairs you’ll find at £50. 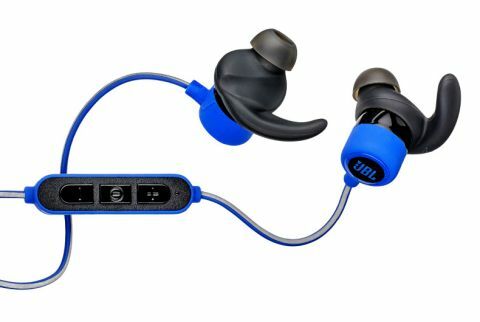 If you’re sick of the trend for bass-heavy sporty earphones, the JBL Reflect Mini BT are worth checking out. But they’re not class leaders. The JBL Reflect Mini BT are affordable wireless in-ears, an easy sell for iPhone 7 owners who suddenly find their favourite headphones made obsolete. They also have some neat sporty features like secure ear hooks, water resistance and a reflective cable. The sound performance isn’t what you’d assume, though, with lean bass that lacks the depth and punch desirable in a sporty pair. If a lean sound appeals, check them out, but a pair like the SoundMagic E10 BT are likely to have a wider appeal at the price.